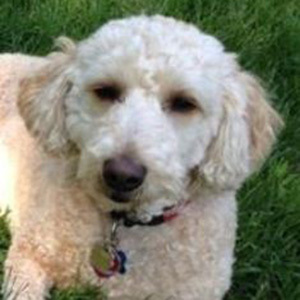 Fozzie (born in 2010) is a very sweet miniature golden doodle. Quite simply, he loves everyone, including children, of all ages. Maggie describes him as a very curious boy who likes to investigate things, but also puts up with just about anything – noise, costumes, and hugs. Maggie & Fozzie visit as a North Star Therapy Animals team to hospice facilities, a hospital, as well as a memory care center in the Twin Cities area. Additionally, Fozzie is a registered Reading Education Assistance Dogs (R.E.A.D.) dog and reads with children in various local libraries. Recently, Fozzie even helped to soothe and calm volunteers at a local high school during a blood drive! Fozzie loves to be with his family – he loves playing on playground equipment and will even go down slides. He’s a pretty good dog, but when there’s a squirrel in his favorite yard (Grandma’s), all bets are off – but he’s always so surprised he never catches one. In the summer, he loves to swim and jump off the boat to retrieve tennis balls. When colder weather prevails, a favorite indoor game is hide and seek.